Most American’s tend to look at their 4 legged friends as members of the family. So when your furry family member starts to suffer from the effects of aging, what can you do? For many years, people have relied on the old stand-bys of fish oil, coconut oil, and Glucosamine supplements to help stop Sparky’s aches and pains, however, there is a fairly new product on the market that can not only help to ease your dog or cat’s arthritis, but it can also calm nervous problems as well, such as separation anxiety and those 4th of July nightmares. What is this almost miraculous, but completely natural treatment? Cannabinoid infused doggie treats. One company selling these doggie snacks is called “Treat-ibles” and they claim that, rather than getting your pooch high, their cannabidiol, or CBD, infused treats helps dogs and cats with a wide variety of ailments, including reduced inflammation, lower pain levels, more mobility, and even depression. It’s understandable that many people are skeptical, but for those who have used them on their four legged family members, they will tell you that these treats are nothing short of a miracle. 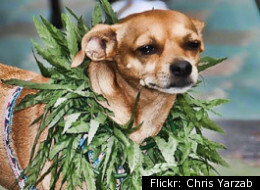 First off, most people think that this is just an excuse by pot-heads to give their dogs a taste of the old medicine, so to speak, but this kind of thinking is incorrect. THC is the psychoactive, which gives you that “high” feeling. 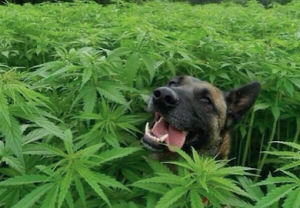 CBDs, on the other paw, are being used for a wide number of things right now including treating PTSD in veterans and those who are suffering from epilepsy. Believe it or not, every living thing appears to have cannabidiol receptors throughout the body. (With the exception of insects) It’s as if Mother Nature designed all living things to use marijuana. One story, published in Quartz.Com, states that a woman named Wendy Mansfield, wanted to find a way to relieve the pain her 15-year-old lab mix dog, Kali, was going through. If she was unable to do this, she had made plans to put him down so that the dog would not suffer. She came upon a medical marijuana dispensary that offered cookies for dogs. She states that after just one cookie (and 20 minutes) Kali stopped licking her paws and coughing. After 3 cookies, Kali got up, got a drink, and walked outside under her own power, with no groaning or any other signs of pain. There are numerous other stories from other pet owners, including those who gave CBD treats for their cats, dogs, ferrets, and, in one case, even a sheep. While there are other alternatives to cannabis cookies, such as Canna Companion, which offers hemp supplements in the form of capsules, treats seem to be the most popular option. While CBD seems to help with common pet problems that come with aging, as well as emotional problems such as separation anxiety and even epileptic seizures, vets are quick to remind people that cannabis treats will help ease symptoms, but they won’t cure cancer, stop your pet from aging, or prevent seizures from ever happening again. The FDA isn’t happy about these products and even sent a few threatening letters to vets and other companies saying that they were skating on thin ice by offering these treats. Companies and vets changed some of the wording on the inserts to placate the FDA, but it remains to be seen if they will take any further action. The FDA seems to feel that these are nothing more than placebo’s, however, it is hard to argue with thousands of pet owners who will tell you that cannabis has helped their pet more than they ever dreamed possible.